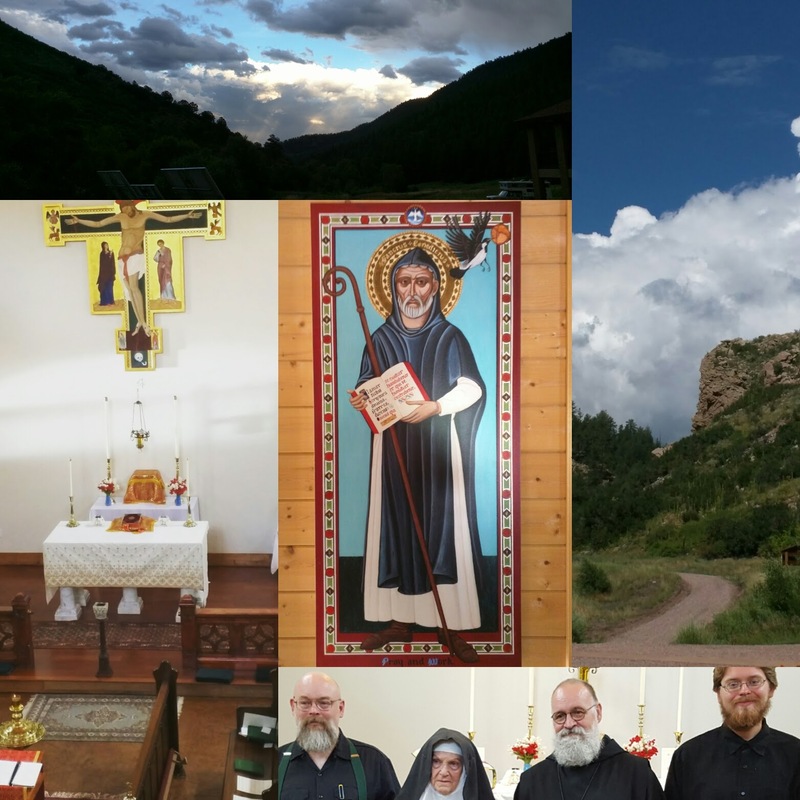 From 6 - 12 August, I was on retreat at the first Western Rite monastery established in the Antiochian Archdiocese. 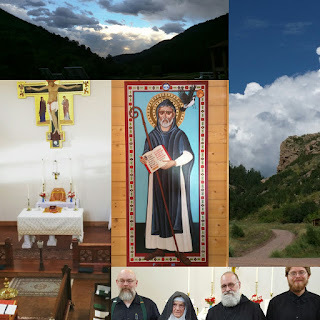 The Monastery of St Laurence & Our Lady of Glastonbury is located about three hours outside of Denver to the South and West, back up in the mountains, near Canon City, CO. Remote: it is some 12 miles down a dirt road to get there. It is a remote valley with a creek zig-zagging back and forth, mountain sheep, deer, and other wildlife. I was told that there are two complete ecosystems in the valley, one high desert and the other mountainous evergreen forest. What I noticed mostly were the sky and the stars: I've not seen the Milky Way in forever! Also, early in the afternoons, the wind would blow for several hours, sometimes on into the evening. The campus includes the Basilica, in which one finds all the monastic cells - for Fr. Prior Theodore and others who by your prayers will get there - and the chapel, as well as a small refectory and the bookstore. There is also a lodge named for St Herman, that is the guest space with rooms (private and dorms) and a larger kitchen. There are a couple of outbuildings, and an Anchorhold for the one nun who lives there, Mother Sophia. I had planned the retreat long before His Eminence, Mtr Joseph, granted canonical status to the community there. All the attendees as as well as the monastics were enjoying the news. There were two different retreats during the week. 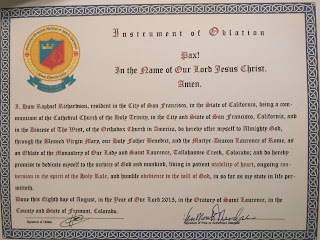 The first, from Fri - Sun, was the annual pilgrimage on honor of St Laurence, who is the patron of the community. When he was being burned for his faith, he rather famously quipped, "Turn me over, I'm done on this side." Saturday morning at the festal mass in honor of St Laurence, Br Nicholas James made his oblation: becoming an oblate of St Benedict. An Oblate is a member of a specific Benedictine Community, who lives in the world rather than full time at the monastery. 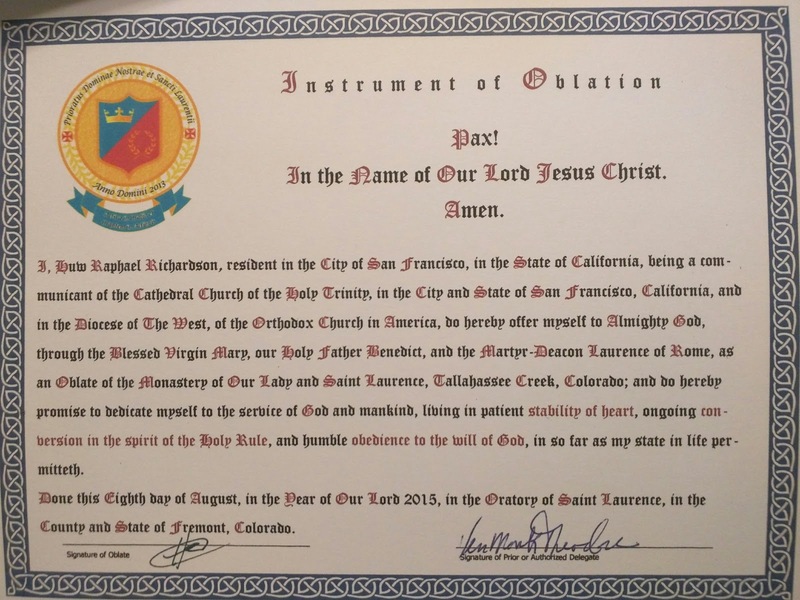 An Oblate is under vows, but they are renewed annually and is attached to a specific community/monastery under the monastic superior. When the community was in formation, some folks who had been Oblates attached to other monasteries petitioned to transfer in and a group of novices were gathered. The first novice to "graduate" after a year in the Novitiate and make his Oblation was Br Stephen. Br Nicholas was the third having made his oblation minutes after Br. Huw Raphael. After Mass and a meal was the talk. Yours truly was honored and surprised to be the presenter for this. The scheduled speaker for both events had suffered congestive heart failure and, while he was, thank God, in good health, coming up to 7600 feet above sea level was probably not a good idea. As we were discussing what to do about this, Fr Prior decided that I was on... Obedience is. Or I am only an egg. Or something like that. Anyway: I did the talk. I doubt you'll find it of much interest, but the recording is on my SoundCloud. 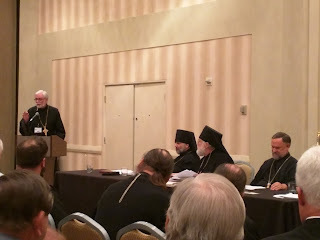 After the talk and Vespers there was a good discussion with Fr Prior and I as sort of panel with questions that started about my presentation, but branched out into other areas. After the Pilgrimage ended at lunch on Sunday, there was a second retreat from Sunday evening until Tuesday at Lunch. This was for the Oblates and novices as well as for people interested in that program. We had 9 folks including 3 guests where were exploring. 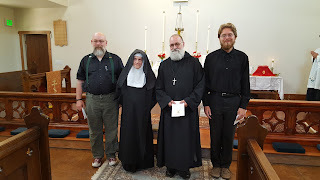 The monastics were present, of course, and also our Retreat Master, Fr Mark Rowe, who is the dean of ROCOR's Western Rite, One thing I did notice: the Western Rite folks are cross-jurisdictional and, unlike some eastern folks, very open to folks from other rites coming along. ROCOR even cross-trains their clergy in rites. 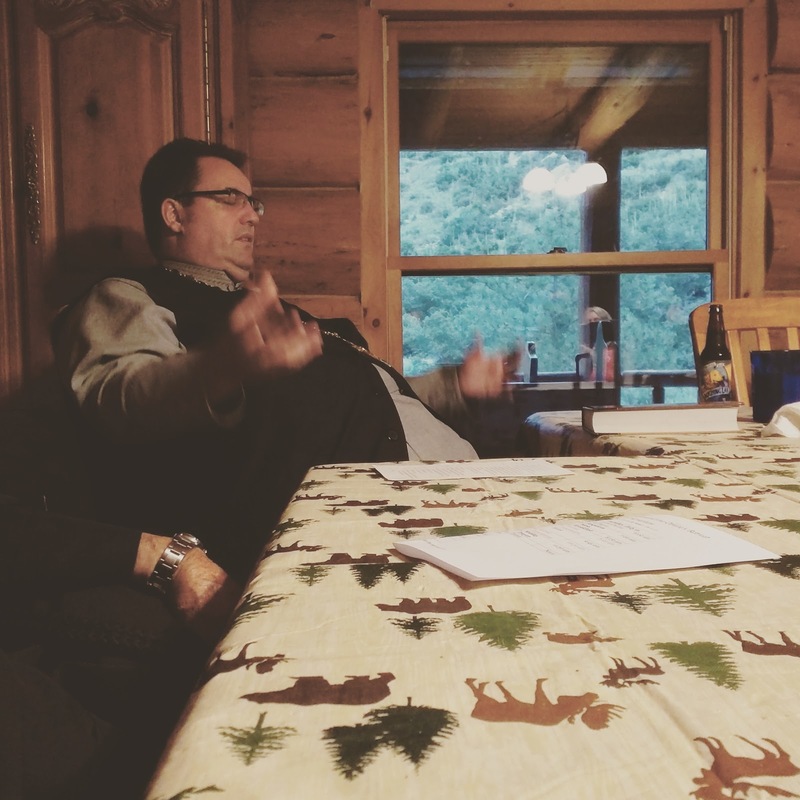 Monday morning, after Matins we held a Chapter Meeting. 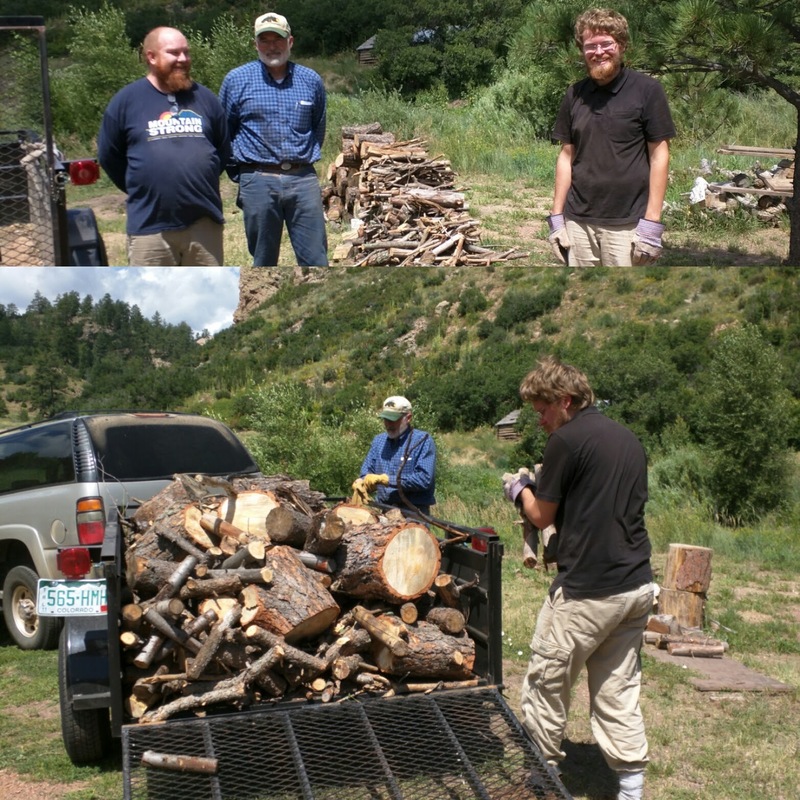 Several of the brothers were dispatched to gather wood for the winter. This is the second part of St Benedict's motto: Ora et Labore - Prayer and Work. 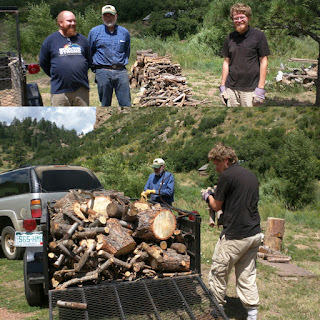 I think we did a good job gathering at least a couple of days' wood. Fr Mark gave three talks, one Monday night and two on Tuesday. His topic can best be summed up like this: The Rule of St Benedict is a cheat sheet for the Christian life. The Oblate is called in no other way than to be a Christian in the world, as the Monk is called to be a Christian in the monastery. Monday night, with Father arriving late from the airport, we just had a brief intro to the topic. Tuesday we got into the meat of it, delving into portions of the rule and discussing them in the context of our life in the world. Father's two main talks are also posted on my SoundCloud: Part 1, Part 2. 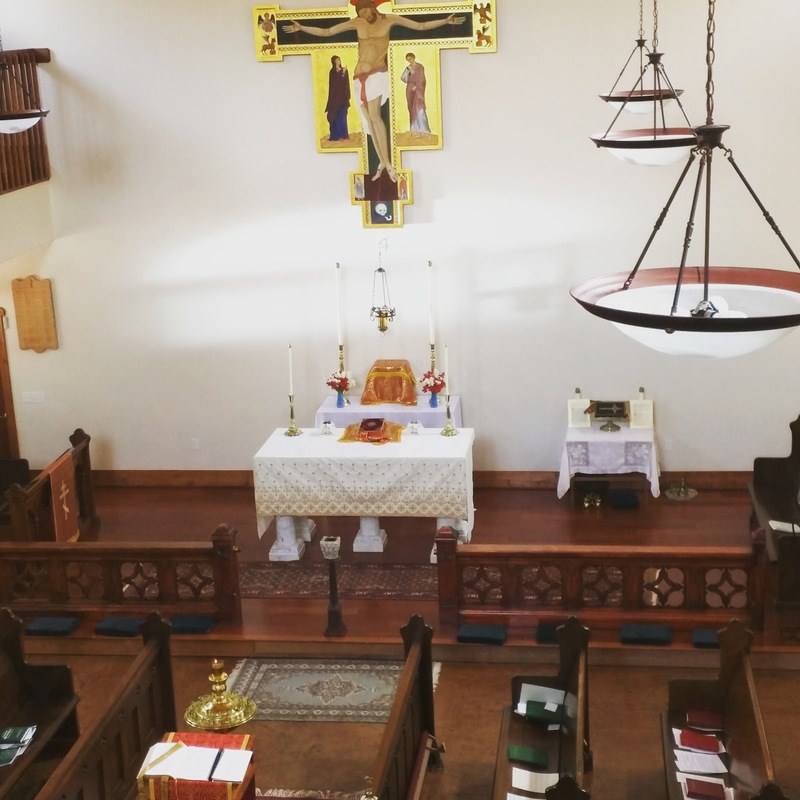 In addition to the Mass for St Laurence and the Mass of Sunday, there was also a ferial low Mass on Monday, a Requiem on Tuesday, and a votive Mass for mission on Wednesday. Since daily communion is not an Eastern thing (Correction: I've been informed that other than lent, Daily Liturgy is common in ER monasteries), it is something I have greatly missed! In addition to the Masses, of course, the Rule of St Benedict also requires the Daily Office of both Monastics and Oblates. So every day there was sung the daily office throughout the day, ending with Compline, sanctifying the time, turning all things in the Eucharist. The daily offices are the "catholicked" BCP rite akin, at this time, to my own Daily Office Website. Br Nicholas and I served as part of the Schola, chanting at Mass, but every one's voices blended so very beautiful in the acoustic space of the chapel. There was Gregorian chant as well as four-part metrical hymnody. In addition to the services at the Monastery, I was also blessed to attend Mass for the Transfiguration at St Mark's Church in Denver. Liturgically have to admit it was a great joy: moving, even, to the point of tears at one point. I've not served a very catholic-minded low-mass or any western liturgy since leaving Smoky Mary's in Manhattan. I make that out to be Carnival Sunday 1989, or so. 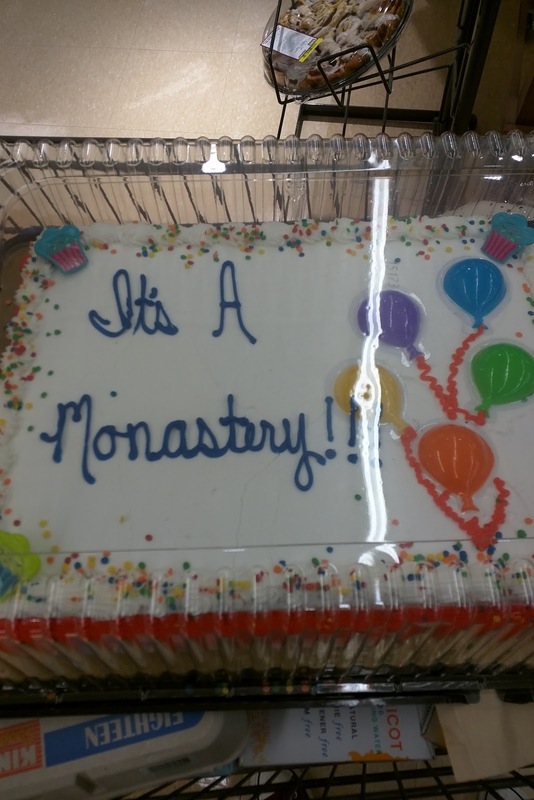 Of course I've served less-Catholic minded liturgies in a lot of places since then. But anyway, using (essentially) the Peoples' Anglican Missal and the Hymnal 1940, this was a great joy to me. I do ask your prayers as I continue to discern what God wants of me, or, as the vows say, "ongoing conversion in the spirit of the Holy Rule." 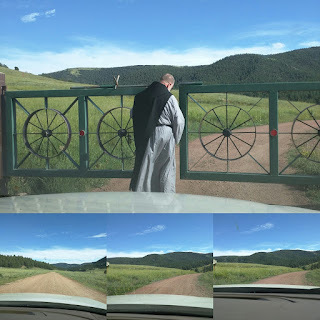 Fr Theodore brought me back to the Denver airport on Wednesday and I was back home and in bed before midnight and back at work the next day, thanks be to God. I wrote this for the Parish Newsletter. This year’s Assembly of the Diocese of the West, at which I was honored to serve as your lay delegate, was only a brief event: just a couple of hours time before the All American Council rather than the two days of meetings and discussions that would have been normal. We gathered in a meeting room off the main All American Council room. His Grace, Bishop Daniel, expressed his thanksgiving to God for his new ministry and for the the support he has received from the clergy and laity of the diocese, and from Archbishop Benjamin. A Diocesan budget was the only major item presented to the delegates for a vote. All other items had been sent to the Diocesans Council to relieve time for the All American Council. The budget’s main change was a move from an “head tax” to a proportional giving that would be shared by all the parishes in the diocese. Over three years all parishes will be equalized in terms of the percentage they give to the diocese. This will mirror the national budget: with each diocese giving a percentage of its budget to the Chancery. After 25 years of discussions, this change passed unanimously. This irenic mindset was present throughout our discussions as well as at the All American Council, as you will have heard already. Fr Andreas Blom presented to the assembly about his mission parishes in Ashland, OR, and Redding, CA. These are a study in contrasts: with the one in the Ashland is growing by leaps and bounds and finding themselves in need of a new building! They have a young and dynamic congregation, with hearts and minds turned towards God’s mission of Evangelism in the world. The mission in Redding is rather different: they are faithful, coming to services, but dwindling. That these very different communities are both until same priest seemed to me to be a sign that to some very great degree it rests on the community to manifest God’s mission in the world although too often we, the laity, like to leave it up to the priest. His Eminence's opening address underscored that one of the hallmarks of the OCA was the previously unheard-of decision to give the laity a voice in the governance of the Church. If we do not take up our responsibilities to God's missions some huge portion of the Church is shirking its duties. Which one of the seven parishes in St John’s Apocalypse are we? We’re not dynamic and growing, but we’re not yet to the point of “last one out turn off the electricity.” But when I look out from the choir over an empty church on a festival or a vigil, I think we are. We all have excuses about our life in this great city, but to one of the Churches in the Apocalypse, Christ says, “You are neither hot nor cold. Because you are lukewarm, I will spew you out of my mouth.” I don’t want to be lukewarm at all. I thought of our Annual Meeting this year when Raul asked why there was no money for mission or outreach (Evangelism) in our budget. As someone mentioned to me recently at our fellowship meal, “That was like the voice of God speaking to us.” Why do we not have that outreach? I thought also of the negative reaction of my fellow council members when I wanted to post a sign outside with our service schedule and inviting everyone in to “taste and see that the Lord is good.” We don’t have a private club. If we are not reaching out to bring the world to God, we have no business claiming to be God’s church.